Forest Gold is a natural, fibrous material stabilised with Pindstrup peat. Wood chips from softwood trees are heated to high temperatures and spun into well-defined fibres using high pressure steam – a process that ensures the material is free from weeds, diseases and harmful organisms. 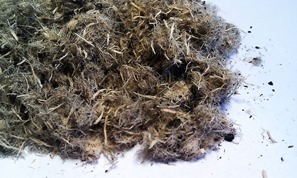 The fibres are then carefully mixed with peat. This is what we call Forest Gold. We add Forest Gold to all general potting mixes and to most crop-specific mixes. It mixes well with all medium and coarse screenings. The standard addition rate of Forest Gold is 30%. This wood fibre/peat ratio gives the best results for the majority of crops; however, substrates can be customised according to specific requirements.